Editor’s note: Every year, Digital Check attends the Masters golf tournament with a few lucky clients and staff. We will post periodic updates throughout the tournament. 1955 U.S. OPEN CHAMPION Jack Fleck, second from left, poses with (left to right): Patrick Koster of Jack Henry & Associates, Digital Check CEO Tom Anderson, and Digital Check’s Mike Donovan. Gates opened at 8:00am on Monday, and we were there as the opened. Beautiful day yesterday with temperatures in the upper 70s. The course is absolutely immaculate on Monday as there has been no foot traffic or wear and tear at the start of the week. Azaleas will be in full bloom by Thursday. One new particular point of interest on the course is to travel down the right-hand side of number 10 and into the woods to get a good vantage point of what Bubba Watson’s shot looked like during the playoff last year. Hard to imagine how you can get a ball to fly out of that gap in the trees and then have it slice right onto the green. There was a constant group of people in that area trying to line that shot up. We also spent a good deal of time sitting along the number 16 par-3 watching as the crowd goaded each group into attempting to skip a ball across the lake onto the green. SKIP! SKIP! It’s interesting, the tone of the chant – almost demanding (SKIP IT!!) if it is a new or relatively unknown golfer, versus more of a “SKIP? ?” request for, say, a Tom Watson. My $1.50 Pimento cheese sandwich was incredible, and of course wrapped in green cellophane so as not to stand out on the course if dropped. After spending most of the day on Augusta National we had the unique experience of spending a little time at Augusta Country Club. Augusta’s “other” golf course was established 33 years prior to Augusta National, and it is home to 1987 Masters champion Larry Mize, among other notable golfers. Sitting on the veranda overlooking the putting green, we noticed a gentleman giving a putting lesson. It turned out to be Jack Fleck. Jack is best known for winning the 1955 US Open, besting a golfer by the name of Ben Hogan. 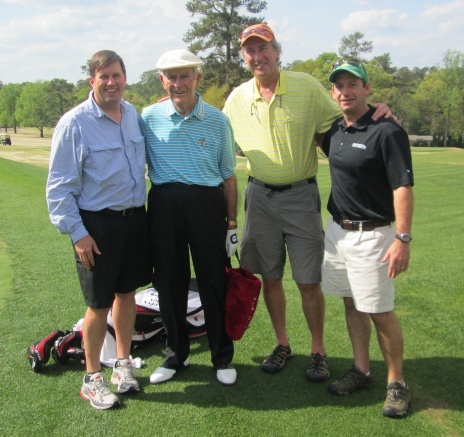 Jack will be participating in the Masters Par 3 tournament this Wednesday at age 91! Rae’s Creek, which flows around the 11th, 12th and 13th holes at Augusta National, is named after landowner John Rae, who lived in the area in the 1700s. Rae kept residents safe during early Indian attacks, and his home was the furthest fortress up the Savannah River from Fort Augusta.